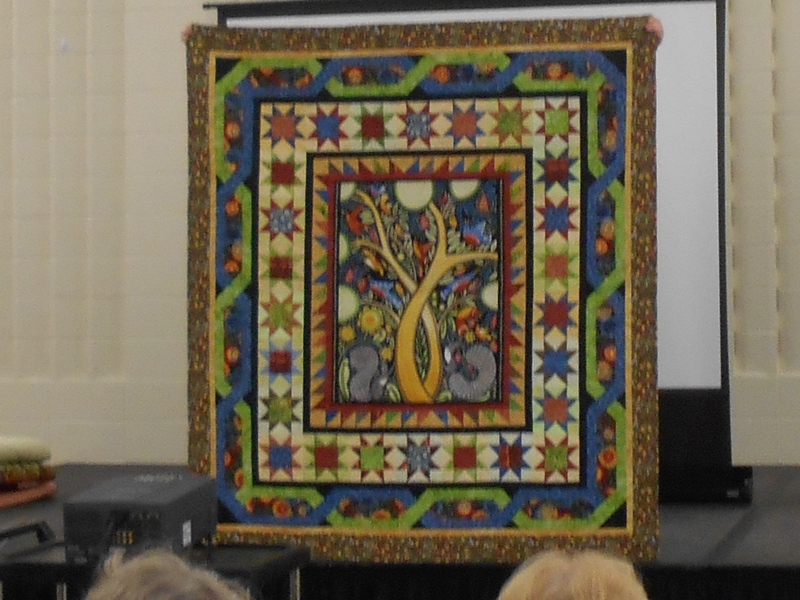 A week ago I had the pleasure of presenting to the DeKalb County Quilters’ Guild in Sycamore, IL. My topic was medallion design basics, including examples of design concepts such as unity, balance, movement, and value. 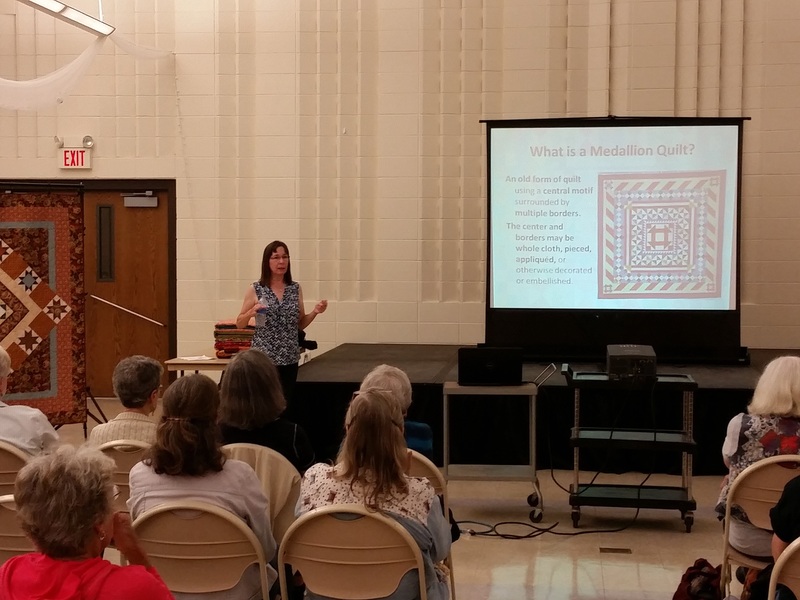 I also discussed the components of the medallion format, including the center block, the first borders, intermediate borders, and last borders. Each has a role to play in creating a cohesive design. 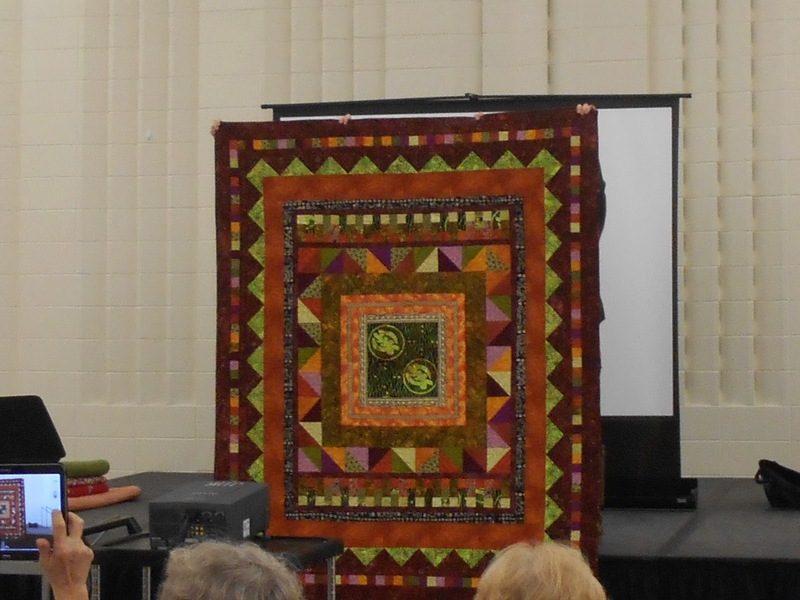 Besides the slide show, I brought 11 quilts with me. I asked the guild members to notice a few things generally. In particular, few of my center blocks are very spectacular themselves, though generally they are bold in their sizing and values. Most of my blocks are pretty simple, variations on Ohio Stars or churndashes or the like. None are elaborate Mariner’s compass blocks, or intricately appliqued designs. 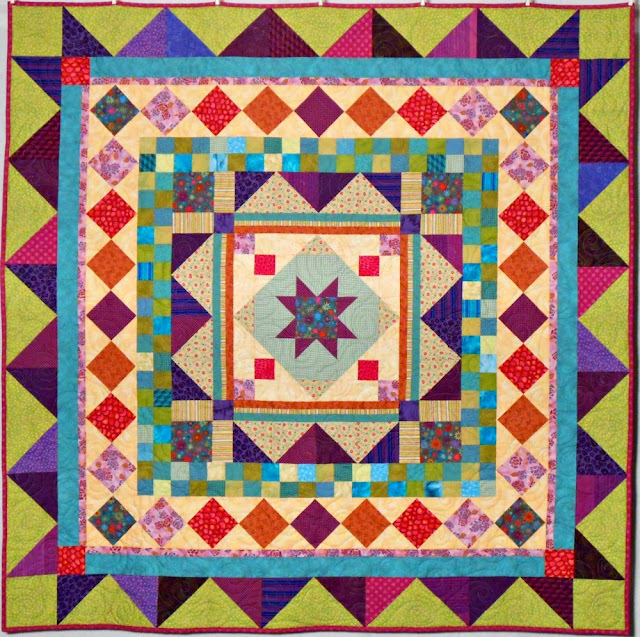 Those are wonderful centers for medallions, but you don’t need fancy to achieve a great quilt. What do you need? You need something interesting to look at. The center block is the natural focal point. The borders around the center direct the eye to and from it with differences and similarities in shape, color, and value. Repetition of shapes, especially when varying sizes, creates interest. Repeated similar colors or patterns, with some variations, make us seek out just what the differences are. Diagonal lines are effective in giving a sense of movement, and half-square triangles are an easy way to provide that motion. Variations are as important as repetitions. Too much of one leads to chaos; too much of the other leads to boredom. As with all else, balance is key. Jim joined me at the meeting, helping to set up and tear down. He also took the following photos. Before we began, three of my quilts hung. Three quilts from my Medallion Sew Along, with good examples of balance, value, color, and shape. Great audience of 75 or 80. They use a church hall for meetings. Me pointing out one of my un-spectacular center blocks. Not fancy but it works well! In addition, Doris Rice, a member of DCQG, allowed me to share her photos. Her complete blog post can be found here. Thank you, Doris! So lovely to meet you. The Flip Side. They also like the back. Stained Glass Too. Another un-spectacular center, gussied up. Quite a contrast in styles. 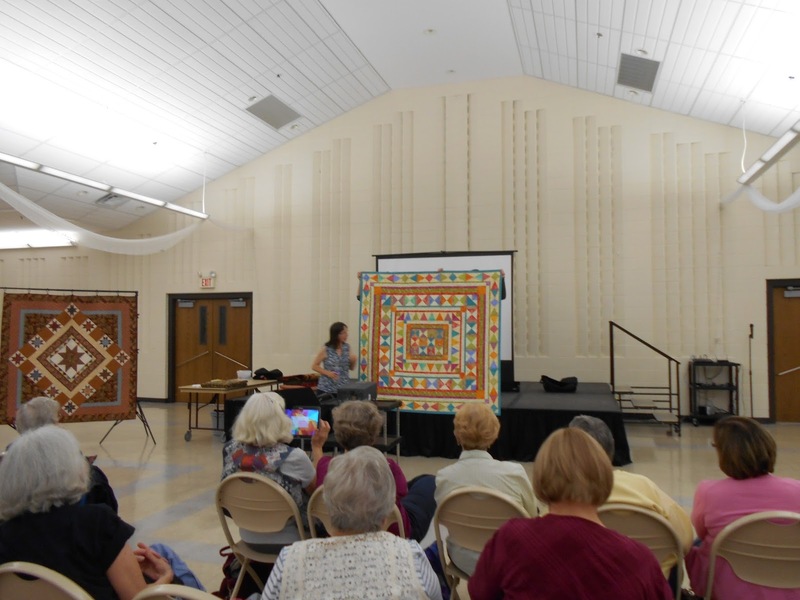 I enjoyed meeting the guild and sharing my quilts with them. 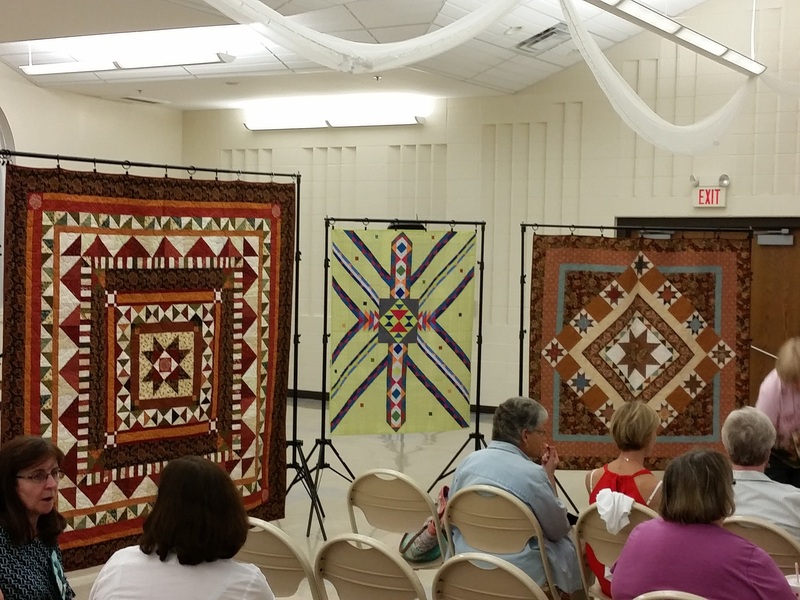 If your guild is interested in a session on medallion quilts, give me a holler. 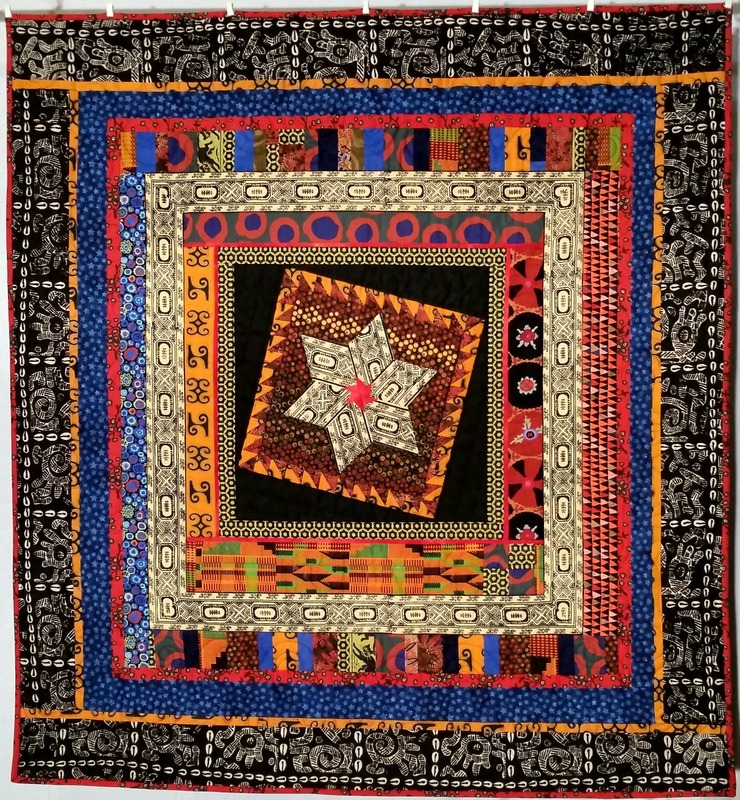 This entry was posted in Creativity, Medallion Quilts, Quilting and tagged Borders, Center block, Guild presentation, Medallion quilts, Medallion Sew-along, Quilt guild on October 1, 2015 by Melanie McNeil. This year my word has been “EXPERIMENT!” Yes, in all caps and with an exclamation point! The emphasis is not angry or scolding, but cheering. To me it is encouragement to try things I haven’t tried before, without expectation of a particular outcome. Why is that important? If I expect a particular outcome or product, and then my actions don’t produce that, there can be a sense of failure attached. Instead, my hope was to be more open to possibilities. I can try something for several iterations, varying aspects until I figure out what really works, or until I’ve learned all I need to from the process. The goal of an experiment is to learn, and success is in the learning, not in the product or outcome. This word worked well for me, for both my quilting/creative life and the rest of my personal life. I am bolder now and more persistent in some creative areas. 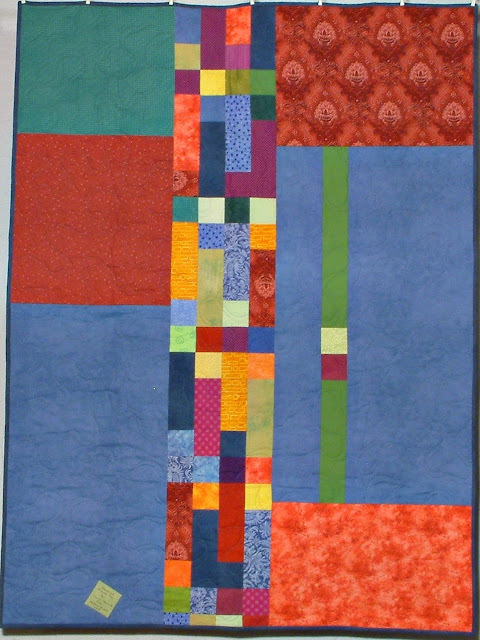 I worked in series in my quilts and continue to find new means of expression in the same form. I began the year completing medallions started for my Medallion Sew-Along. Last year I started nine quilts for the series of posts. So far I have finished eight of them. Six of those nine all began with the same template, or sizes for the center block and borders. Though the template was the same, the variation between the compositions was remarkable. In essence, the whole Sew-Along was an experiment for me. Here are two of my favorite finishes from it. In the spring I began teaching a class on my medallion Design-As-You-Go methods. 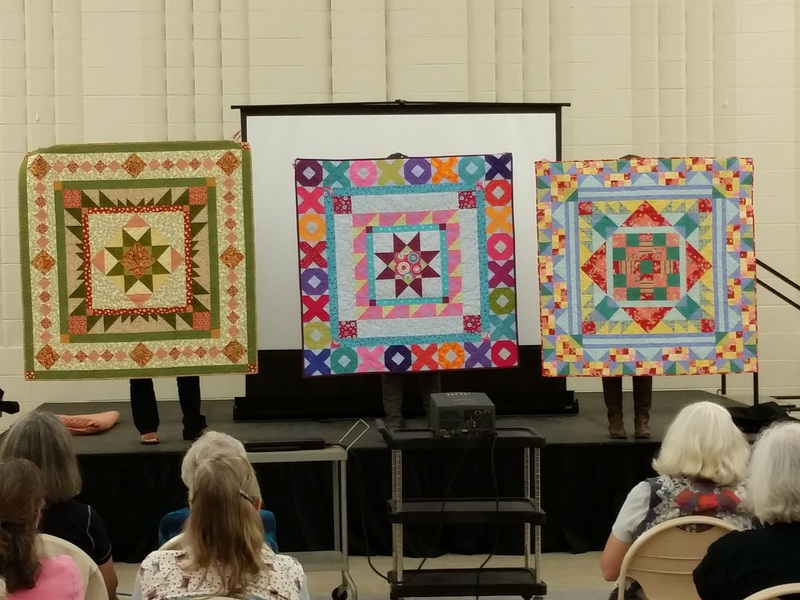 The five students were all talented, experienced quilters. Their creativity, enthusiasm, and generosity made the class a tremendous success. I hope to teach it again. Though I will do some things differently, the first go-round was a worthy experiment. Besides my quilting, writing is an important creative endeavor for me. In July my experiment was to submit a short story for publication to a magazine. The editor-in-chief replied to me that very day! She said she loved the story, but the magazine was about to cease publication. She encouraged me to submit it elsewhere. So far I have not, but mostly because I haven’t identified another potential publisher yet. The quilting magazines with which I’m familiar don’t publish short stories, and I’ll need to look for another venue. In addition, I submitted another work for publication. In this case I sent in a proposal for a book. The publisher declined, but again encouraged me to submit elsewhere. I’m still mulling my options here. Besides quilting and writing, I’ve been experimenting in my personal life. I tried out a new attitude for winter in January and February (though it rather fell apart in March…) I’ll try it again this year. And Jim and I tried snowshoeing for the first time. We enjoyed it enough to buy ‘shoes, hoping to spend more time outside even in winter. In September we went to northern New Mexico to vacation. We hike when we can here in Iowa, but we enjoy a challenge and were eager to try the higher elevations. Taos, NM is at about 7,000 feet above sea level. Just walking around in town is some 6,000 feet above our local elevation! But we also hiked in the mountains, including a wonderful outing above 11,000 feet. That’s more than two miles above sea level! That hike was a triumph especially because an earlier one at a lower elevation had led to significant pain in my knees. Persistence paid off. Using “EXPERIMENT!” as a focus word helped encourage me to try things, and to try again. I’ve thought a lot about my word for 2015. I expected I’d change it, probably to “explore.” However, I’ve gained so much by experimenting that I will continue with this year’s word. Did you have a focus word for 2014? Was it helpful to you? Will you choose one for 2015? I’d love to hear about it. 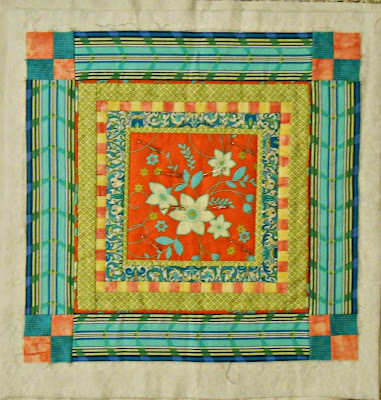 This entry was posted in Personal, Quilting, Quilts and tagged Experiment, Medallion Sew-along on December 6, 2014 by Melanie McNeil. It occurred to me recently that I hadn’t shown you all my finished Sew-Along samples together. I started six samples for what I’ve called “Track 1,” which had prescribed center block and border sizes. And now all six are done. They are SO different from each other, even though the templates were the same! Begin with a 15″ center block. Leave it with a straight setting or turn it on point. 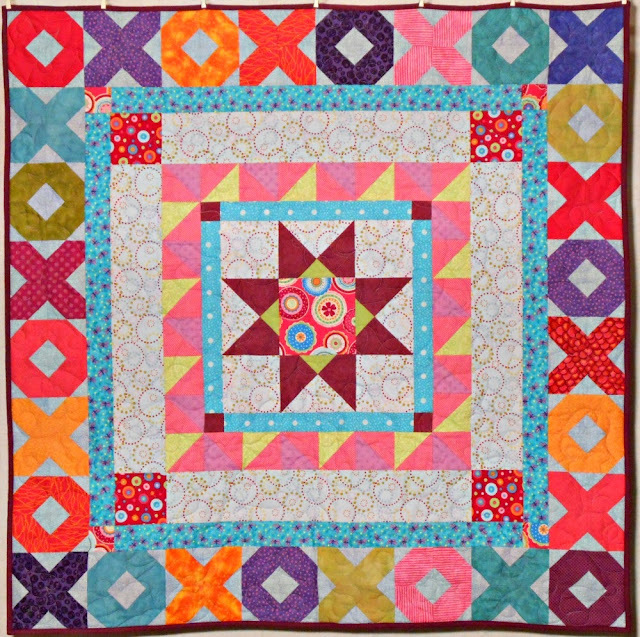 The first border set, whether you set your block on point or straight, takes your center to 24″. 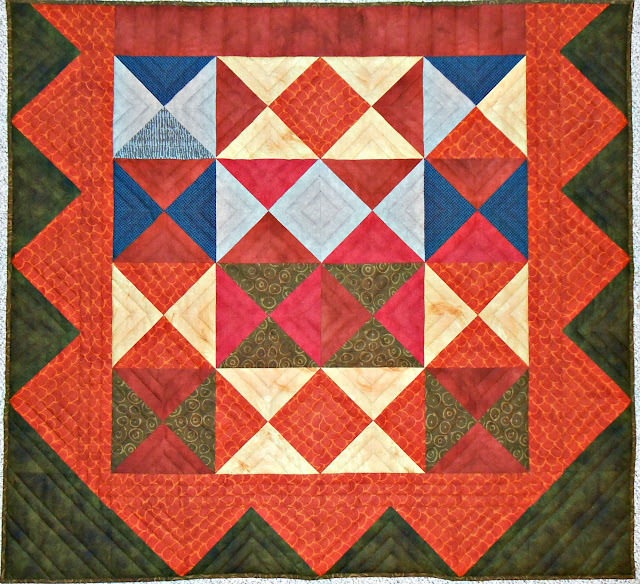 The second border set added a 4″ border, taking the border to a total size of 32″ finished. The third border set added a 2″ border, followed by a 6″ border. This takes the finished size to 48″. More borders were optional. As you can see below, I did add more for three of them, and I made one smaller. 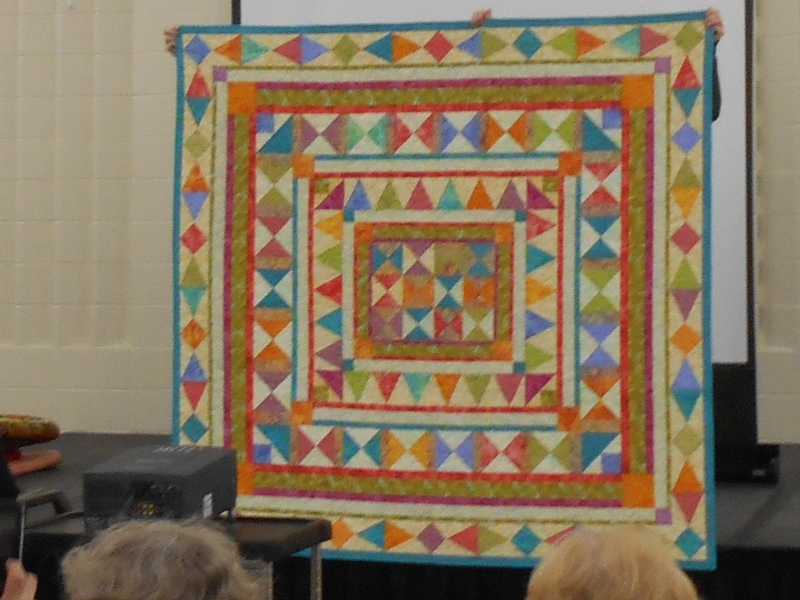 To see photos of the finished quilts, click here! 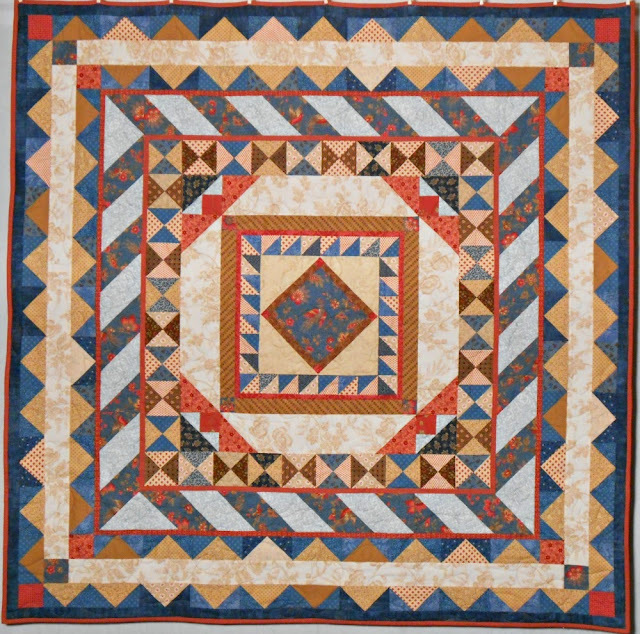 This entry was posted in Creativity, Quilting, Quilts and tagged Center medallion, Design, Design-As-You-Go, Medallion quilts, Medallion Sew-along, Original design, textiles on July 18, 2014 by Melanie McNeil. FFF, 42″ x 44″. Unquilted, July 2014. 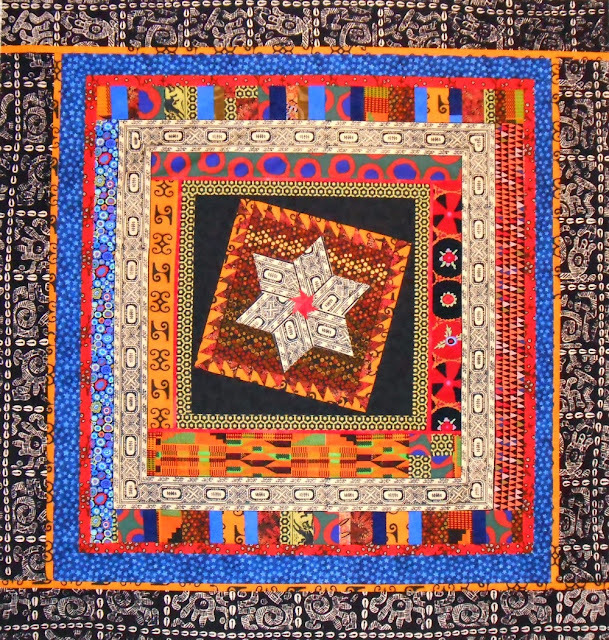 The center star was the first part of this project. I built it, faced it with lightweight fusible interfacing, and appliqued it to the background. It is appliqued rather than pieced into the background to retain the stripe of golden dots across the top. Next I rimmed that with 1″ half-square triangles that includes an African print. And that is how it stayed, waiting patiently for me to begin again. Maybe that’s when it started to scare me. This isn’t my usual style, though it IS my usual format lately, a medallion. At every step I’ve had to remind myself that nothing needs to be permanent. Any portion put on can be taken off again. It is not so precious that it can’t be changed. And so I framed the center with black, and tipped it off-square, and loved it. And it waited again until after I began the Medallion Sew-Along last fall. Someday, somehow, a very odd geometric print appeared in my stash. Of citrus green on black, it features interlocking circles and angry cats. And it became the next frame on my slowly-building quilt top. I followed that with different fabrics on each side, separated from the center with a very narrow red line. The same African stripe used to build the center star became the next border. At that point I wasn’t sure if it was done. So I did what I usually do: I asked someone else. My sister Cathie said “no,” not done yet. It still needed some heft to offset the darker center. And I asked Jim. He said “it needs blue.” Blue? There’s no blue here! But in fact, there is a blue-purple in one border and touches of blues in another. He has not failed me yet, so I tried blue. Whaddya know, blue was the thing to brighten and strengthen everything already there. But blue all the way around? Too strong for me. So I used blue print on one side and stitched solid blues into an uneven piano keys border made from scraps. And I chose yet another print for the fourth side. Busy! But … intriguing… To corral it all, I ringed it with red and black print, echoing the red star center and the red line used earlier. One more line of blue, this time all the way around. It’s a tone-on-tone with stars, the perfect Americana touch to complement the African fabrics and feel. 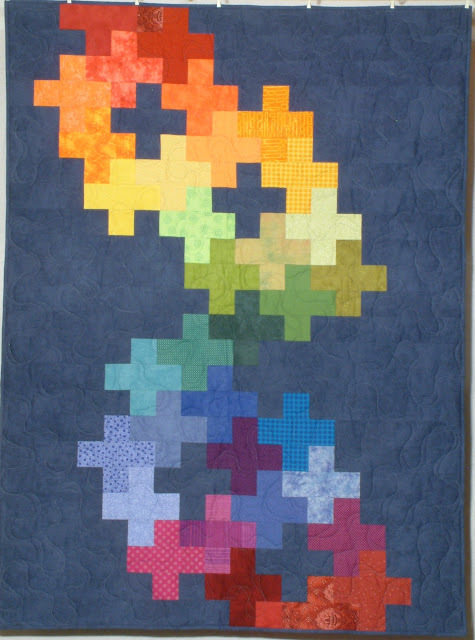 This quilt will be for a friend, explosive and stable at the same time. The stars are another hat tip to him. The final border is another African print of black and cream, edged with the same brilliant orange found near the center. I really had to talk myself through this. What was scary about it? Mostly the worry that if I “ruined” the African fabrics, I wouldn’t be able to replace them. Also, because it will be a gift, I want it special enough to honor my friend. The next intimidation factor I’ll need to overcome is quilting it. I think that will be less frightening, if only because the design is so busy, quilting will hardly show! Thanks as always to Cathie and Jim for their encouragement and advice. What’s the most recent “scary” project you’ve done? Why were you hesitant? Did you work through it? Were you happy with your results? 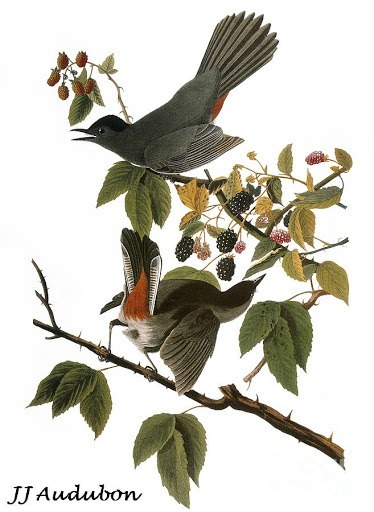 You can find Catbird Quilt Studio at Facebook, too. 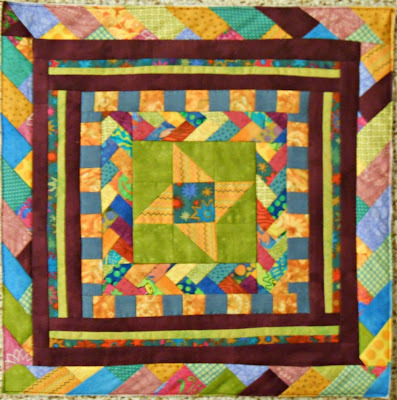 This entry was posted in Creativity, Quilting, Quilts and tagged Creativity, Design, Design-As-You-Go, fabric, Friendship, Medallion quilts, Medallion Sew-along, Original design, Process on July 10, 2014 by Melanie McNeil. Back of quilt. Label is tipped green square in lower left. Triangles Table Runner. 32″ x 14″. Finished May 2014. XOXO. 48″ square. Finished June 2014. Round Robin Mini-Medallion. 14″ square. Needs binding and label. Mini Medallion with changed corners. 15.5″ square. Needs quilting finished, binding, label. And what else have I been up to? Well, I added the page tab for free designs. If you look there, you can find designs for 3 quilts, and design ideas for 17 different ways to set economy blocks. Keep checking back as I’ll add more over time. 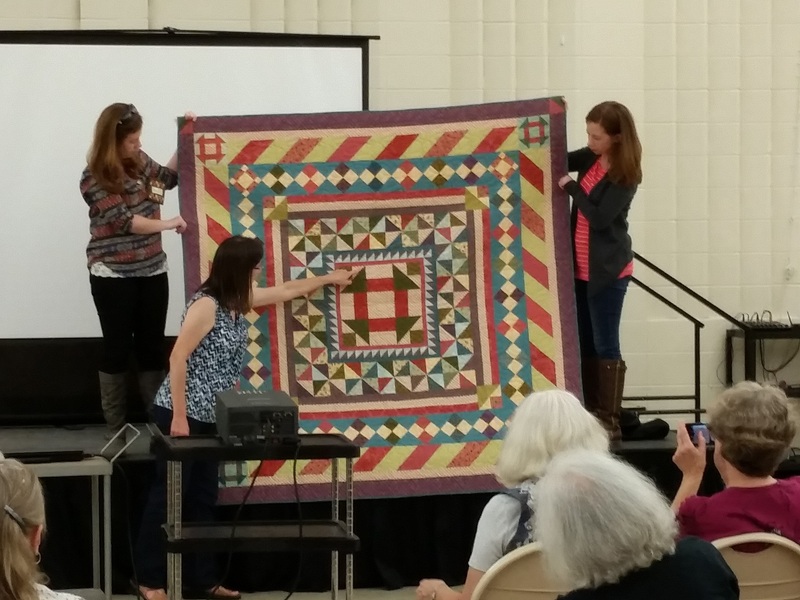 In early April I gave a presentation on the Underground Railroad Quilt Code. And in late April I began teaching a five-week class called Medallion Improv! I can’t tell you how much fun that was, helping five experienced quilters discover strategies to design their own medallions, as unique as they are. Besides joining BlogLovin’, I added a Facebook page, to make it easier for you to find me and to comment. Like the page in Facebook to join the fun. 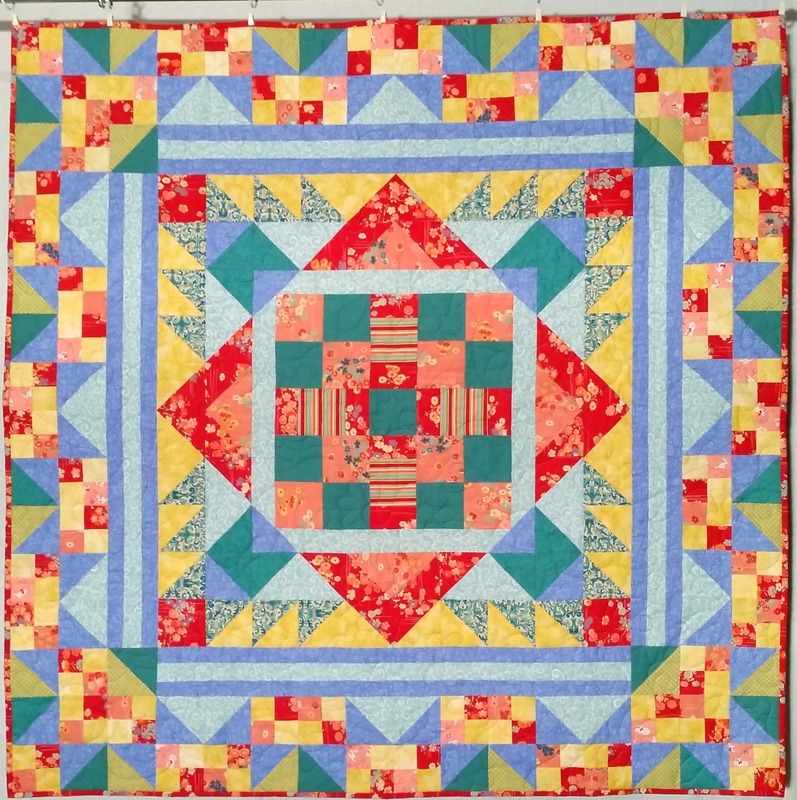 This entry was posted in Creativity, Quilts and tagged Center medallion, Creativity, Design, Designing, Experiment, Medallion quilts, Medallion Sew-along, Progress, quilting, Round robin, Sharing, teaching, textiles on July 5, 2014 by Melanie McNeil.